ESA RN 34 CFP for Prague 2015- special PHD students session! The call for papers for Prague 2015 will start on 8 December. 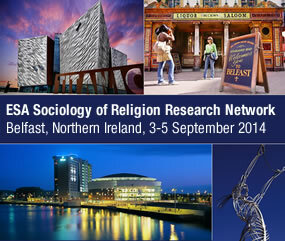 For a special session, we invite PhD students working within the field of sociology of religion to submit their papers focusing on the issues highlighted in this CfP. The aim of this session is to provide an environment of intellectual exchange between young researchers wishing to share their work. Interdisciplinary approaches will also be encouraged, so researchers approaching the topic of religion from other perspectives (i.e. cultural studies, gender studies, media studies, etc.) are invited to submit their individual or joint proposals. As a follow-up to the PhD students’ session, we invite all young researchers participating in the RN’s sessions to join a networking meeting. It would be a great opportunity to find out more about your colleagues’ current projects and research interests, and to hear more about ESA RN 34 and other international associations or networks which you may be interested in joining. Specific time and date to be announced in due course. From Haskalah to Reinterpretation of Tradition: A Crisis in American Reform Judaism in the 21st Century (Martina Topic, Centre for Research in Social Sciences and Humanities, Zagreb, Croatia). You can preview the book via Google Books here.